The user-friendly and feature-rich HiliteUI Admin Template is highly responsive, which guarantee a fine user experience on both mobile devices and desktop. This admin template is built by using the Bootstrap framework, SASS, jQuery, HTML5, and CSS. Customization is a lot easier too because the styling of HiliteUI is done by SASS preprocessor. The clean and well-commended code of the HiliteUI Admin Template can be comprehended easily. HiliteUI also features an excellent collection of UI elements, theme styles, color schemes, and more. 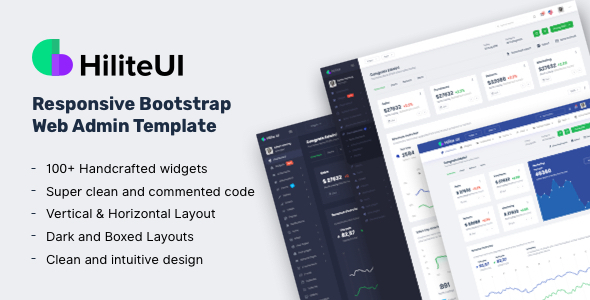 This template is cross-browser compatible and can be used to build admin dashboard, application backend, CRM, CMS, and other web applications. Users who purchase the HiliteUI Admin Template will be eligible to download future updates of the template for free.